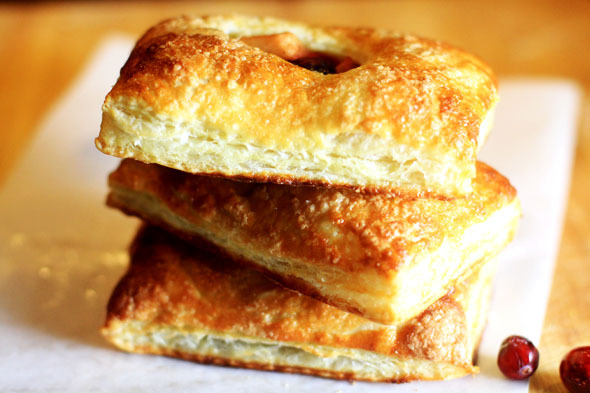 Filling puff pastry with deliciousness (sweet or savory) is what you’re supposed to do in life, other than continue to be great. 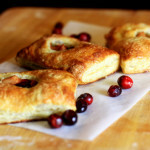 Therefore, sweetening up a few tart apples and fresh cranberries and throwing them in between two layers of buttery, flaky puff pastry is your human right. These pies are incredible — easy to eat, portable, not too messy. They’re perfectly juicy, not too sweet, and a great beginning or end to any meal. 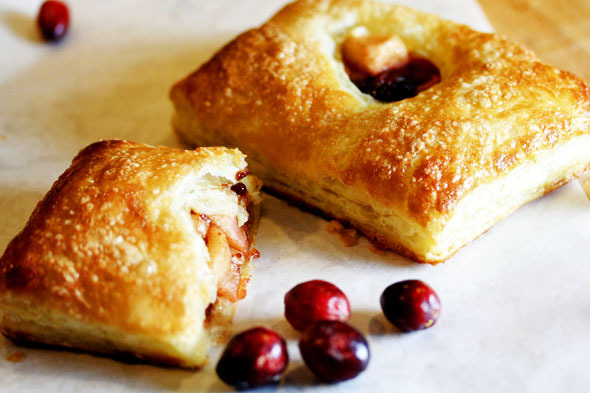 The apples and cranberries are par-cooked, just so they can release some of their delicious juice and come together in a cohesive bounty of Fall deliciousness. 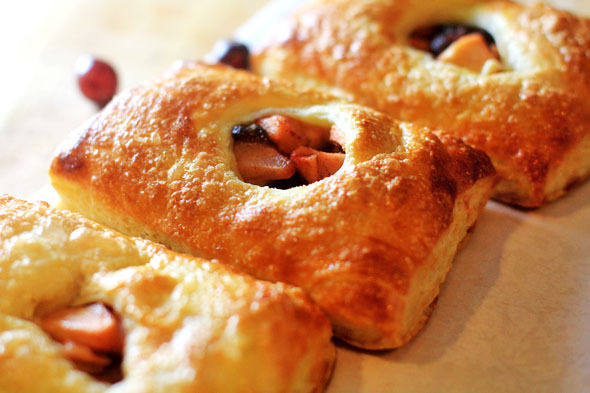 The sugary crust on top of the puff pastry makes it extra special. Exercise your right and make these delicious pies — they go great with coconut gelato or any ice cream. Try pouring a little caramel sauce on top if you want to take it to “mama slapping” levels. 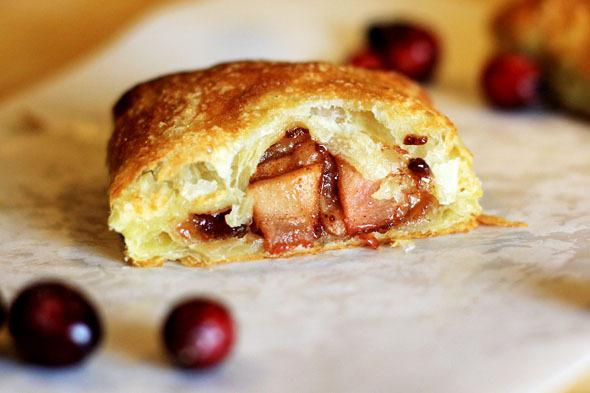 Goodness, who doesn’t love buttery dough smushed together with cinnamon’y apples and tart cranberries? If you don’t like cranberries, you can leave them out, but they really add something great to the overall flavor of the pie. When I used to eat at a particular fast food chain as a kid, I would always order one of those fried bubbly, crackly texutred apple pies that were full of artificial filling encased in a gloopy clear blob — and they were delicious! At least they were when I was a kid, I didn’t know any better. Thank goodness my palate grew up. I do know that particular fast food chain now serves a revamped apple pie, that looks a little more “homemade”. Their crust is totally different, and the apples are a little more pronounced — but I still won’t touch’em. I’d much rather make my own. 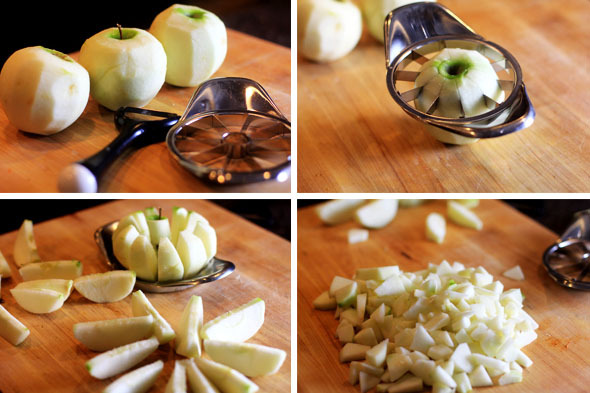 Peel and core your apples. Then chop into even bite-sized chunks. 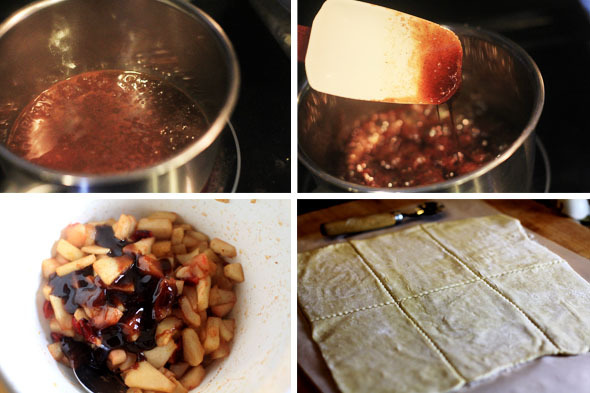 Toss together the chopped apples, cranberries, sugar and spices. Let sit for 20 minutes to macerate. Wrap with plastic and microwave for about 5 minutes, until the apples release a substantial amount of juice. 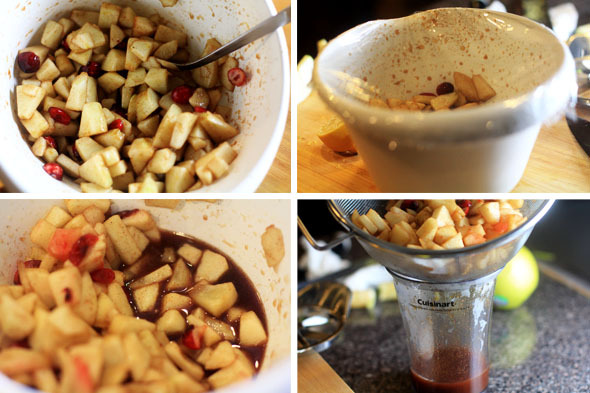 Drain the apple mixture, you should have at least 1/2 cup of juice. In a small saucepan, boil the reserved apple juice over medium-high heat until syrup’y and reduced by half, about 3 minutes. Make sure you stir frequently so that it doesn’t burn or scorch. Add the reduced apple juice mixture back to the apples and toss to combine. It may harden on you a bit, but don’t worry, it’ll re-melt once it’s in the oven. Just try to get it as evenly combined as you can. 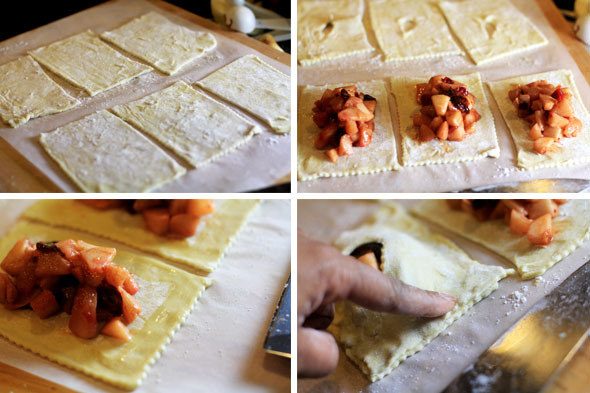 Cut each sheet of puff pastry into 6 squares, for a total of 12 squares — I’m only showing 6 squares for this post. 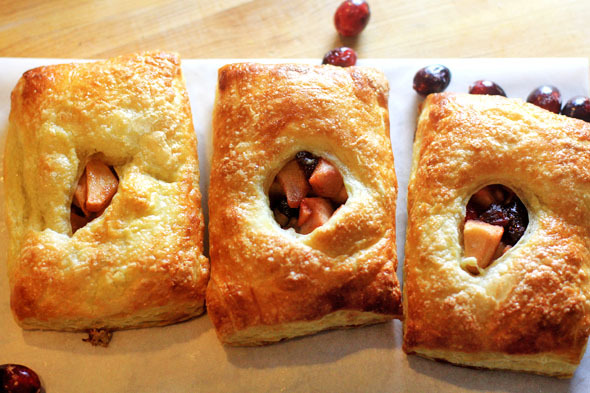 Cut a small vent hole into 3 of the first 6 puff pastry squares, and scoop some of the apple mixture into the centers of the remaining 3 puffy pastry squares — you will repeat this step w/ the other 6 squares of the second sheet. Whisk an egg and brush the inside edges of each square — this will be our “glue”. 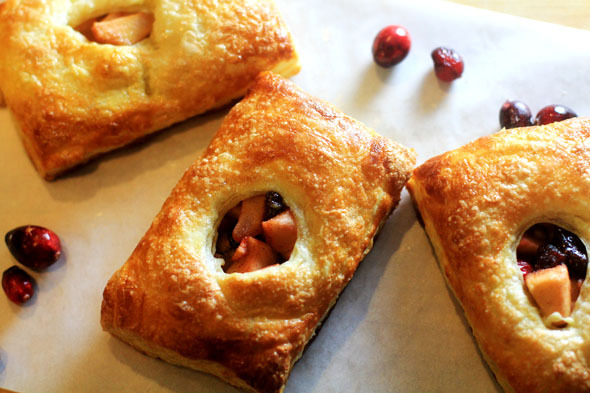 Place a square with a cut vent hole on top of the square w/ the apple mixture, press to seal. Trim the very edges of each handheld pie to further seal, then brush the tops w/ the egg in a thin layer. Do this for each pie. 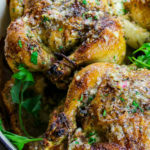 Sprinkle sugar on top of the egg wash, then bake on a parchment-lined baking sheet for 20-22 minutes, or until golden brown. 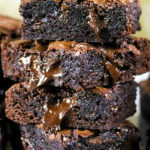 Then you get this puffy, golden little bundle of sin…oh my..
Equipment you’ll need for this recipe: parchment paper, a rimmed baking sheet, a sharp knife or pastry cutter, and a fine strainer. Heat your oven to 400 degrees, middle rack in place. In a bowl, mix the apples, cranberries, brown sugar, cinnamon, nutmeg, cloves, salt, lemon juice, lemon zest, and vanilla together until evenly combined. Cover with plastic wrap and let this mixture sit for 20 minutes. The sugars will pull out the moisture from the apples so that they don’t make our pies soggy later. Microwave the macerated apple-cranberry mixture for just 5 minutes to par-cook the apples and cranberries (you’ll hear them pop) and give them a head start. More liquid will be released. 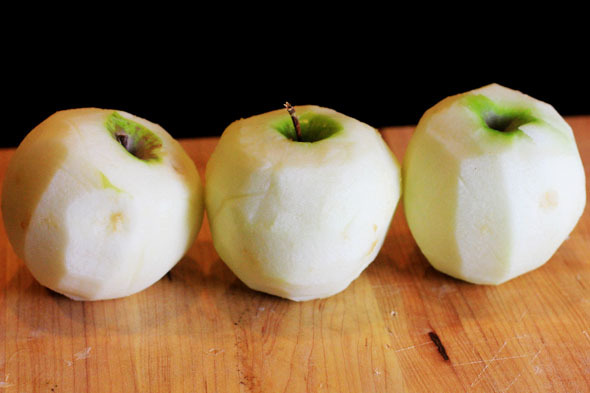 Carefully strain the apple juice mixture into a measuring cup or bowl for 5 minutes. You should have at least 1/2 cup of juice. Whisk an egg for about 15 seconds into a small bowl and set aside. Pour the apple juices into a small saucepan and bring to a steady simmer over medium-high heat, stirring constantly until thickened and syrup’y, and reduced by half — 1/4 cup. This can take anywhere between 2-5 minutes, depending on your stove. Add it back to the apples and cranberries, and toss to combine. 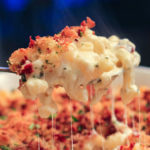 It may harden just a bit, and that’s ok because it will melt again once it’s in the oven. Add 2 tablespoons of cornstarch to the apple-cranberry mixture and toss to coat. 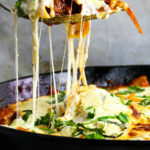 This will help thicken our filling just slightly. Meanwhile, roll both puff pastry sheets out just a bit to smooth and seal the 2 lines going down the middle of each sheet. Flour both sides lightly to prevent sticking. 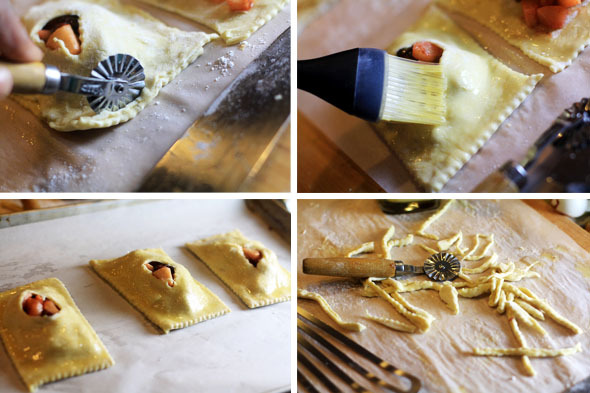 Cut both puff pastry sheets into 6 even squares, for a total of 12 squares total. Cut a small vent hole into 6 of the 12 squares. Scoop about 1/2 cup of the apple-cranberry mixture into the center of the remaining 6 squares. With a pastry brush or your index finger, paint a thin border around each edge of the puff pastry square that has the apple mixture on it. Place a square with a vent hole on top, gently stretching if you have to — be careful not to tear it, and press the edges together with your fingers. With a sharp knife or pastry cutter, trim the very edges of each pie to clean them up and further seal. You should have 6 pies. Brush each pie with a thin layer of the egg wash, and sprinkle a thin layer of sugar all over the surface. Bake the pies on a parchment lined baking sheet on the middle rack for 20-22 minutes, or until golden brown. 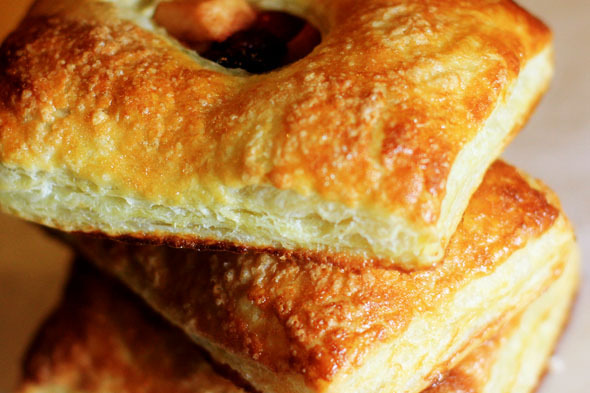 Thaw puff pastry on your kitchen counter, covered, for about 30 minutes, or until pliable. 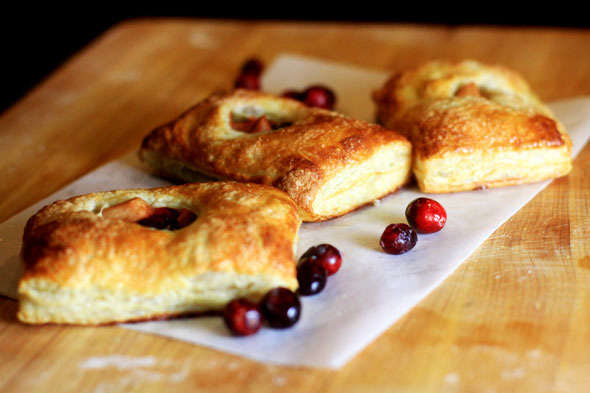 It should be good to go by the time you’re done with the apple-cranberry prep. Puffy pastry should stay cold enough so that the butter in it doesn’t melt while handling. If you notice your pastry dough is getting too warm, throw it back into the fridge or freezer until it’s cold again, about 10 minutes. Make sure you keep it lightly floured while working with it to prevent sticking. These are quite lovely. I love the combination of apples and cranberries. 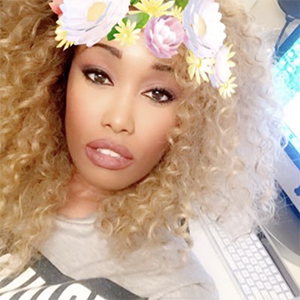 Hi Jocelyn! Yes, that combination is so classic and always delicious. Don’t tell anyone I ate almost three of these though lol. 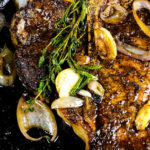 Can you “par-cook” in the oven? I no longer own a microwave! These look nice! 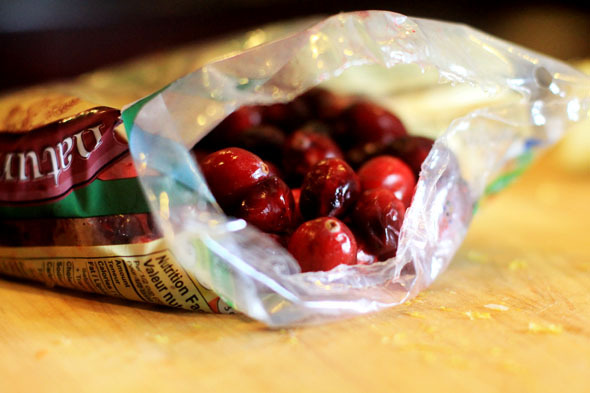 I have a bag of cranberries in my fridge that I don’t know what to do with. You’ve just given me an idea. 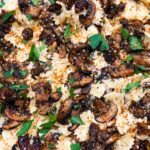 If I triple this recipe can I make it into a large pie?